In 2015 Manoush Zomorodi, host of WNYC's popular podcast and radio show Note to Self, led tens of thousands of listeners through an experiment to help them unplug from their devices, get bored, jump-start their creativity, and change their lives. Bored and Brilliant builds on that experiment to show us how to rethink our gadget use to live better and smarter in this new digital ecosystem. 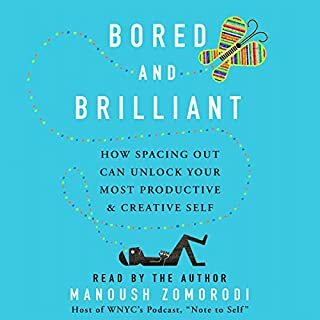 In this fascinating new audiobook, Manoush explains the connection between boredom and original thinking. I absolutely loved & enjoyed the challenge at the heart of this book. It was a work that met me exactly where I was at in my personal life regarding technology and offered practical steps to take further control of my relationship with my phone while reinforcing some of what I’d come to on my own with a wealth of research. The information is well organized which made it easy to follow along as an audio book. The anecdotes are highly engaging and Manoush’s performance made the whole concept very accessible. I’m looking forward to buying the hard cover and transferring my notes to their pages and open up discussion with my family about ways we can all embrace some of these concepts in our home. I highly recommend this book to anyone looking to have a better command of or who is asking questions about their relationship with technology. Emerging from France's catastrophic 1940 defeat like a bedraggled and rather sinister phoenix, the French State – better known to history as Vichy France or the Vichy Regime after its spa-town capital, stands in history as a unique and bizarre creation of German Fuhrer Adolf Hitler's European conquests. 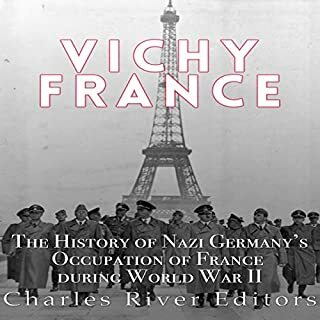 A patchwork of paradoxes and contradictions, the Vichy Regime maintained a quasi-independent French nation for some time after the Third Reich invasion. The short book reads like a Masters level dissertation. It is well researched & presents a very important piece of WWII history with a scholarly touch. If you're looking for a brief overview of the Vichy regime, this book is an excellent choice. But be warned, Mr. Crockett's narration is awful. You will have to fight through his constant mispronunciation of vocabulary, both common & academic, his well intended over annunciation and amateur-hour voice affectations, indistinguishable from one character to the next, during all historical quotes. Honestly, if I hadn't been so eager to dive into this subject, I would have requested a refund because the book is almost unlistenable due to performance.